Professional mosquito control is essential in Georgia. It is a well-known fact that mosquitoes are one of the most dangerous insects in the world. Because mosquito control products and methods have not been perfected, this vector can spread diseases rapidly across large geographical regions. Mosquitoes have been found to be carriers of diseases such as Zika Virus, West Nile Virus, malaria and numerous other diseases. Although it hasn’t been confirmed by the scientific community, mosquitoes may even be able to spread HIV. Microcephaly is “now only one of several” birth abnormalities associated with the Zika virus, Margaret Chan, director-general of the World Health Organization, said during a press conference in early 2016. Fetal death, placental insufficiency, fetal growth retardation, and injury to a fetus’ central nervous system are all associated with the virus. “We can now conclude that Zika virus is neurotrophic — preferentially affecting tissues in the brain and brain stem of the developing fetus,” Chan said, before cautioning that proving a link between Zika and these birth defects will take more research. Additionally, the virus has been linked to Guillain-Barré Syndrome, a severe neurological disorder that can cause temporary paralysis in people of all ages. With this in mind proper mosquito control, mosquito management, and mosquito pest control product applications around your home and business are vital part of taking care of your family and employees and keeping them as protected as possible. When considering mosquito control, one of the first things to consider is that mosquitoes breed in areas where there is stagnant water. This includes ponds, pools of water or open containers or items that can collect rainwater. You can start you own mosquito control program by removing any of these from around your home. If you have a pond you can reduce the chances of mosquitoes breeding by installing a pump and waterfall or fountain to keep the water flowing if you do not want to remove it from your property. Water features make mosquito control a bit more challenging, but if done properly the enjoyment benefit supersedes mosquito control and mosquito management challenges. Continuing with mosquito control and vector management advice, once you have removed any possible breeding places from around your home and still have to deal with a mosquito infestation you may need to call in a team of professionals to help you with a mosquito control program that includes mosquito control products and systems that will help to eliminate them from your yard and home and protect your family from being bitten. There are many different methods of mosquito control a team of professionals can use around your home to reduce the risks of mosquito- transmitted diseases as well as the amount of mosquito annoyances. One of the more common methods is the use of mosquito traps, bug lights and application of mosquito control I.G.R.s to breeding areas so that the number of mosquitoes in the mosquito-infested environments are reduced to as close to zero as possible. Your mosquito extermination company should suggest a combination of natural and chemical approaches to the mosquito extermination problem to ensure the best possible protection for your family. One of the best possible methods of achieving mosquito control in a yard is to plant natural mosquito repelling plants. The most popular plant being used today for controlling mosquitoes is citronella. The smell of the plant alone is considered a very effective mosquito repellent and having several of these plants around your doors and favorite spots in your yard help provide natural and effective mosquito control and mosquito management. Other plants such as lemon thyme, catnip and rosemary can be used quite successfully to repel mosquitoes, but natural mosquito control should be supplemented with professional mosquito control. Your pest control and mosquito control company may recommend the use of mosquito foggers or misting systems as part of your mosquito control services. These machines actually heat the mosquito insecticide and fog your yard with low levels of insecticide that kills the mosquitoes instantly. Your fogger should coat under trees, under plants and bushes to provide the best possible mosquito protection and mosquito control. If you would like to learn more about mosquito control and what steps you can take to have mosquito protection for your family you should contact the experts here at Forsyth Exterminating and inquire on our mosquito control program. 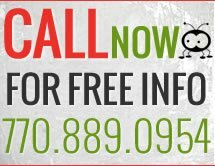 Since 1980 they have serviced the residents of Atlanta, Georgia and Forsyth County, Georgia and the surrounding areas offering the highest level of pest control, mosquito control, termite control, and wildlife animal removal service possible. They use the latest environmentally friendly methods possible to ensure the continued health of your family and the removal of a variety of pests and mosquitoes from in and around your home.